Abd Halim Saifuddin & Assoc. Abd Halim Bin Din is a lawyer since October 4,1992 currently practicing in Abd Halim Saifuddin & Assoc., Kangar branch, Perlis. You may reach Abd Halim Bin Din at 04-9773726 , 04-9773727. 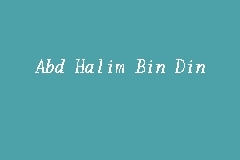 Abd Halim Bin Din works as a lawyer for more than twenty-years.